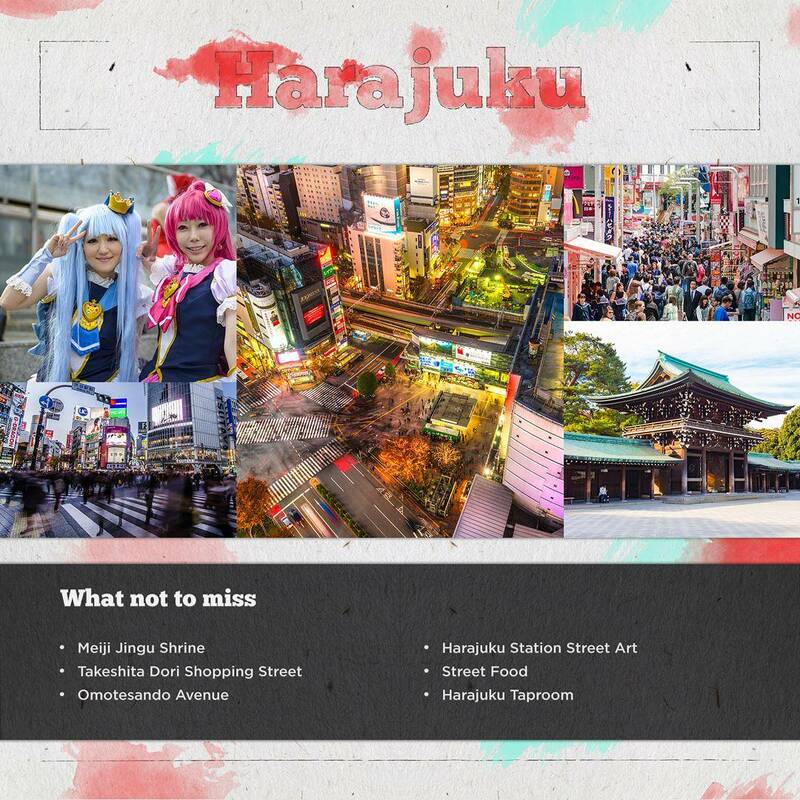 You’d be hard pushed to find anyone without a pretty detailed mental image of what Tokyo is like – from the dazzling bright lights and dizzying skyscrapers, to the rainbows of colour decorating every street courtesy of Harajuku girls, anime fans and raucous cosplayers. Of course, this image is accurate. But as the capital city of one of the world’s most innovative and enterprising countries, Tokyo has a lot more to offer than that. 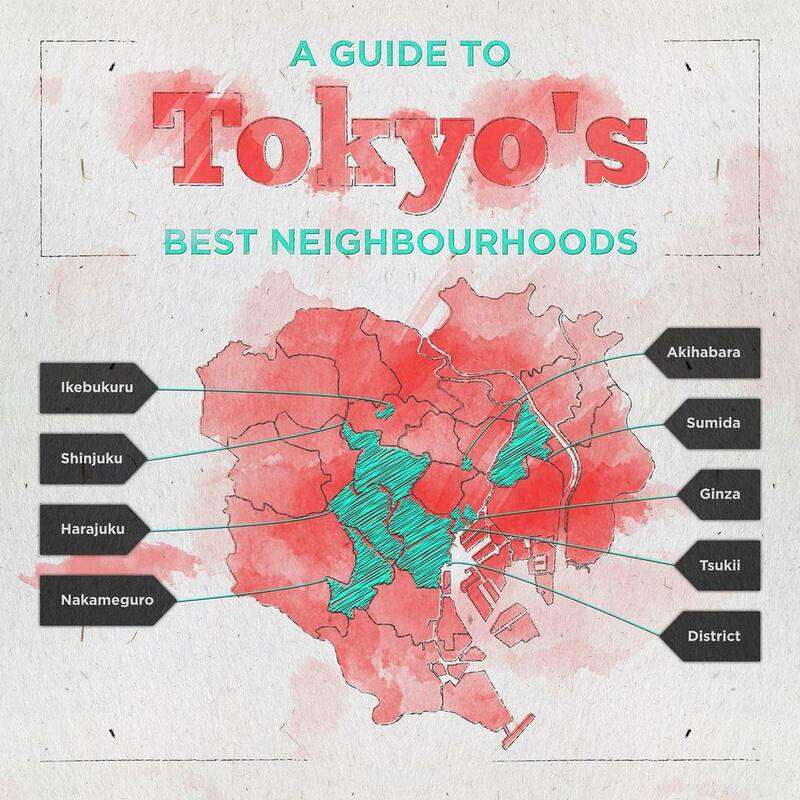 We’ve explored the city’s many diverse neighbourhoods to bring you a guide to each of them – konichiwa Tokyo! 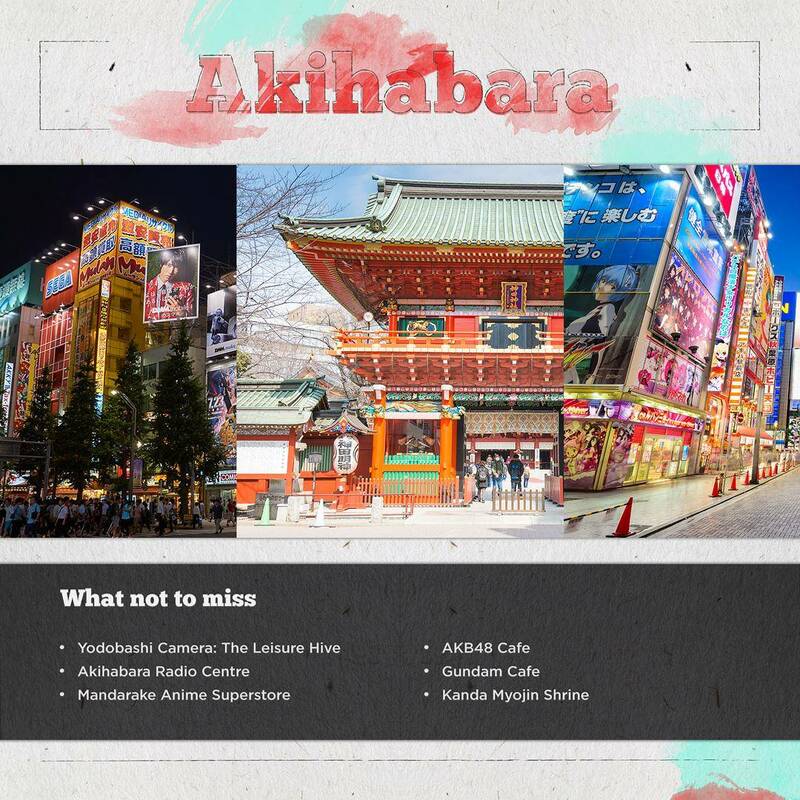 Busy, bustling and always full of life, Ikebukuro is a humming commercial and entertainment district with much to offer the curious Tokyo visitor. Never knowingly mediocre, its most renowned mall, Sunshine City, is home to an aquarium, planetarium and amusement park, surrounded by streets that simmer with performances and anime enthusiasts touting their wares. What really makes this neighbourhood tick however, is its foodie scene. Aromatic stalls selling succulent gyoza and frothy bowlfuls of ramen can be found on every street corner, and experimental culinary enthusiasts have set up shop in Ikebukuro’s countless avant-garde restaurants, noodle bars and, that’s right, cat cafes. Seeking a real taste of Tokyo? You’ve found it! Yamanote Line – Ikebukuro’s main vein of shopping, eating and entertainment, this extended train station runs through the heart of the neighbourhood. Nishiguchi Park – A tranquil haven amongst the hustle, Nishiguchi Park is a green space in which to relax and take a weight off. Tokyo Metropolitan Art Space – A glittering, angular example of pioneering architecture, Tokyo Metropolitan Art Space is home to an ever-changing roster of exhibitions and performances. Sunshine City – A monolithic shopping mall, as well as its plethora of boutiques and stores, Sunshine City houses an aquarium, amusement park, planetarium and an observation deck from which to take in the views from above. Cat Cafes – Ikebukuro has at least three of these feline friendly coffee joints. 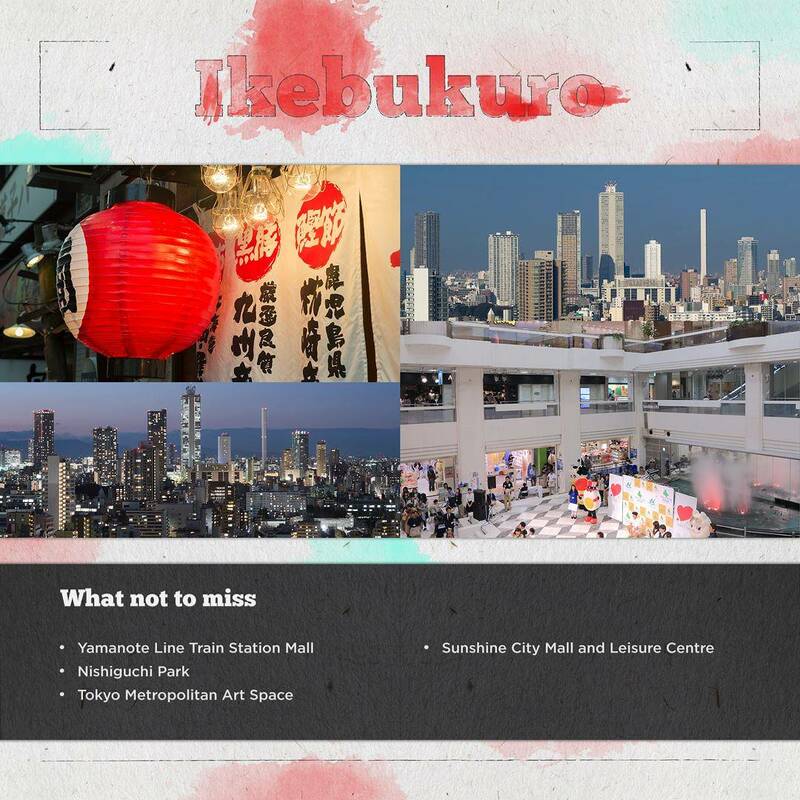 Fast-paced and endlessly energetic, Shinjuku is at the helm of all things business and commercial in the city. With street upon street and plaza upon plaza of designer boutiques, glimmering malls, K-Pop shops and rickety stalls, if you’ve got Yen burning a hole in your pocket, this is the place to spend it. Shinjuku’s Koreatown is a tangle of fragrant street-food, life-sized anime characters and trashy karaoke bars in which to warble away an evening. 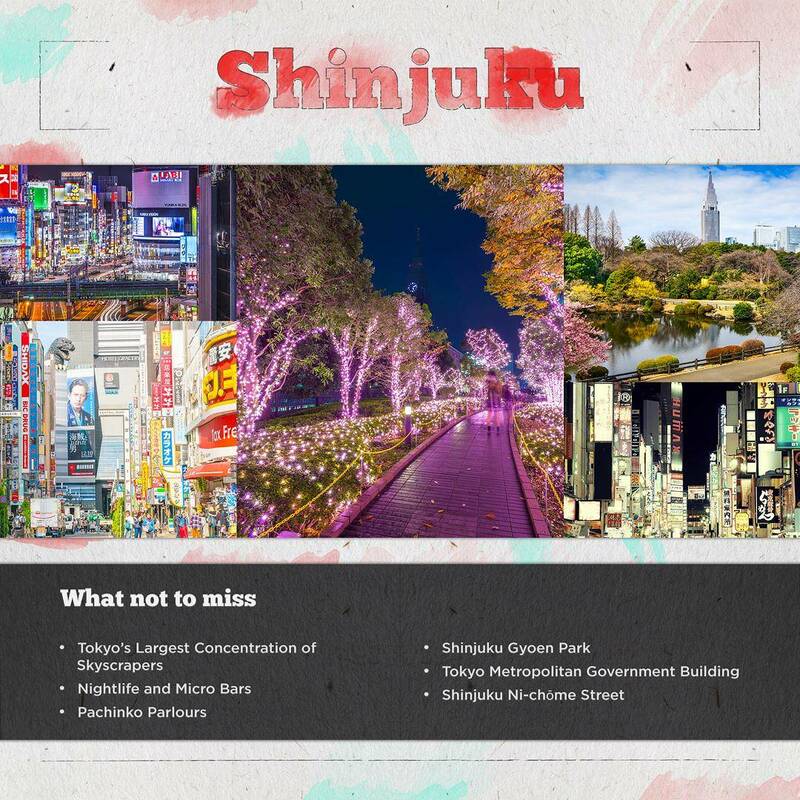 As well as some of Tokyo’s most vibrant and ebullient nightlife, Shinjuku is also home to the city’s busiest train station – its endless cycle of commuters seething through barriers on the daily commute is worth witnessing alone. Tokyo’s skyscrapers – Home to the city’s largest concentration of skyscrapers, Shinjuku keeps on rising. Tokyo Metropolitan Government Building – An imposing structure with some of the best city skyline views around from its top deck. Nightlife and micro bars – Shinjuku is home to many of the city’s greatest clubs, bars, lounges and venues. Golden Gai is a great place to start – big enough to sink a few pints, this street of poky watering holes is a novelty way to get the party started. Pachinko parlours – The Japanese equivalent of a games arcade, these parlours of fun are dotted throughout Shinjuku. Shinjuku Gyoen – One of Tokyo’s best loved parks, this expansive green space is especially beautiful in cherry blossom season. Shinjuku Ni-chōme – A multi-coloured warren of streets and the centre of the city’s gay culture. A trendy, canal-side enclave of the Meguro District, laidback Nakameguro is best enjoyed in full bloom, when the iconically Japanese cherry blossoms embellish its narrow streets and hang in garlands across the water. It is also during this season that Nakameguro’s canal is lined with food stalls and pop-up bars, and residents spill out to soak in the atmosphere. As you might expect of a hip, city hangout, Nakameguro has more than its fair share of chic coffee houses, vintage stores, izakayas and bookshops, most of which can be found along the buzzing Nakameguro Ginza, which also happens to be the district’s oldest shopping street. 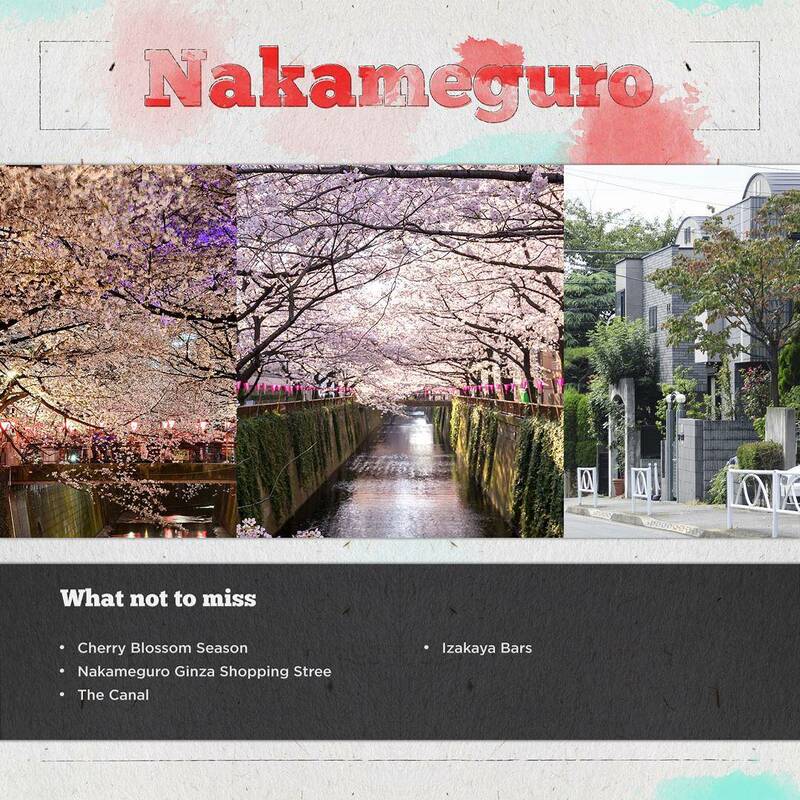 Cherry blossom season – Usually taking place in the Spring between the start of March and end of April, this is the prime time to visit Nakameguro. Nakameguro Ginza – The district’s oldest shopping street, overflowing with vintage shops and izakayas. The canal – Running right through the heart of Nakameguro, the serene canal is hard to miss, and endlessly picturesque. Izakayas – The Japanese equivalent of tapas bars, these traditional mini restaurants are great for snacking and coffee. Shokaku-ji Temple – Well worth a visit for the selfie opportunities. Renowned the world over for its unique, candy-pop-and-sparkles trends, Harajuku explodes from Tokyo’s streets in a kaleidoscopic cataclysm of colour, cosplay and Kawaii. Often revered as the city’s fashion capital, this flamboyant congregation of self-styled icons is Tokyo at its most spirited, youthful and experimental. The neighbourhood’s Takeshita Dori is the hub of all things Harajuku-cool – a street lined with neon fashion shops and boutiques overflowing with weird trinkets and wacky costumes. Omotesando Avenue adds an element of elegance and class to the area, often referred to as ‘Tokyo’s Champs-Elysees’ and home to a sprinkling of high-end restaurants and designer stores. Whatever your style, Harajuku welcomes you into its fold – come as you are, and leave as you want to be. Meiji Jingu Shrine – A little out of Harajuku’s multi-coloured hordes, this ancient temple is a beautiful example of ancient architecture. Takeshita Dori – Lined with quirky fashion shops and unique boutiques, this is the street on which to kit yourself out with all the latest Harajuku trends. Omotesando Avenue – Airy and chic, this is the neighbourhood’s most upscale shopping destination. Harajuku Station street art – The neighbourhood’s main station is a hotbed of some of the city’s best graffiti art. Street food – Street vendors line every street, and Harajuku is particularly renowned for its crepes. Harajuku Taproom – One of Tokyo’s only microbreweries, this is a great way to sample the local hops. The suited and booted professional face of Tokyo, Minato is the city’s heaving financial district with glittering skyscrapers and glistening glass surfaces a-plenty. After dark, Minato loosens its tie and really lets its hair down, with lively clubs, bars and venues throwing open their doors and staying open way past the early hours of the morning. By far the most vibrant of Minato’s nightspots is the pumping Tokyo Bay, a waterfront row of slick bars, lounges and exclusive clubs. 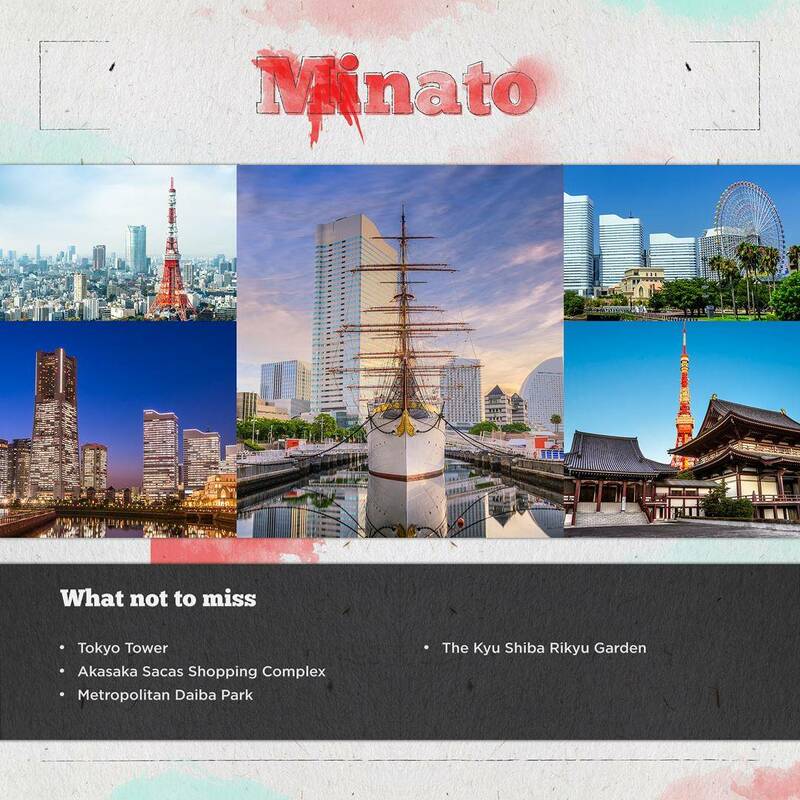 As well as being the scene of many a night of hedonism, Minato is also home to many of the city’s most iconic landmarks, from Tokyo Tower to Rainbow Bridge. Tokyo Tower – An essential feature of the city skyline, Tokyo Tower is magnificent from ground-level, and even more so from the inside of its observation deck. Akasaka Sacas – Tokyo Broadcasting System’s multipurpose complex houses a collection of restaurants, bars, galleries and boutiques, as well as many outdoor lounge areas for chilling out. Metropolitan Daiba Park – This artificial island off the coast of Minato is replete with verdant trees and grass, and affords incredible views of Minato’s Rainbow Bridge. The Kyū Shiba Rikyū Garden – Often considered the most perfectly manicured and stunningly designed public garden in the whole of Tokyo, this is a must-visit for all green-fingered tourists. Rainbow Bridge – One of the city’s newest iconic landmarks, this structure is illuminated in a melange of colours on festive occasions. Otakus, manga fans and die-hard cosplayers, this is your stop. With its explosive, multi-coloured, day-glo energy, Akihabara or ‘Akiba’ as it is fondly known, is the beating, cartoon heart of Tokyo’s world-famous pop culture. The neighbourhood’s main street is a seething, flashing hub of neon adverts, anime graphics and crowds of cosplaying teenagers, with even its flanking buildings painted a glorious range of acid colours. Akihabara was given the nickname ‘Electric Town’ following WW2 on account of its booming trade in technology and electrical goods, and the title is as true today as it was back then. Basically, if you’re looking for the Tokyo characterised by twee Maid Cafes, futuristic technology and outlandish fashionistas, this is the place to be. Yodobashi Camera: The Leisure Hive – An expansive retail outlet offering everything electrical from gadgets to digital prints. Akihabara Radio Centre – A narrow tangle of tiny electronic vendors and radio retailers snugly nestled beneath the Sobu rail-tracks that has been wheeling and dealing since the 40s. Mandarake – For all manga and anime fans, this is the ultimate dream – eight floors of superheroes, iconic cartoons, comics and artwork old and new to rummage through. AKB48 – A cafe-slash-shop dedicated to celebrating the music of Japan’s (and indeed the world’s) only 48-strong girl group, AKB48. This sickly-sweet eatery serves up all manner of treats and boutique buys, all against the backdrop of a wall-sized screen playing looped footage of the band. Gundam Cafe – A robotic-themed cafe where staff are dressed as stylised automatons and even the waffles come android-shaped. Kanda Myojin Shrine – Just outside the chaotic, colourful sprawl of Akihabara, Kanda Myojin Shrine is a calming oasis of old Japanese architecture. Glittering, glamorous Ginza offers a taste of the finer things in life. From its rows of upscale designer stores and chic boutiques, to sleek galleries and exhibitions, this neighbourhood is the haunt of Tokyo’s fashion-conscious stylistas and elegant celebs. 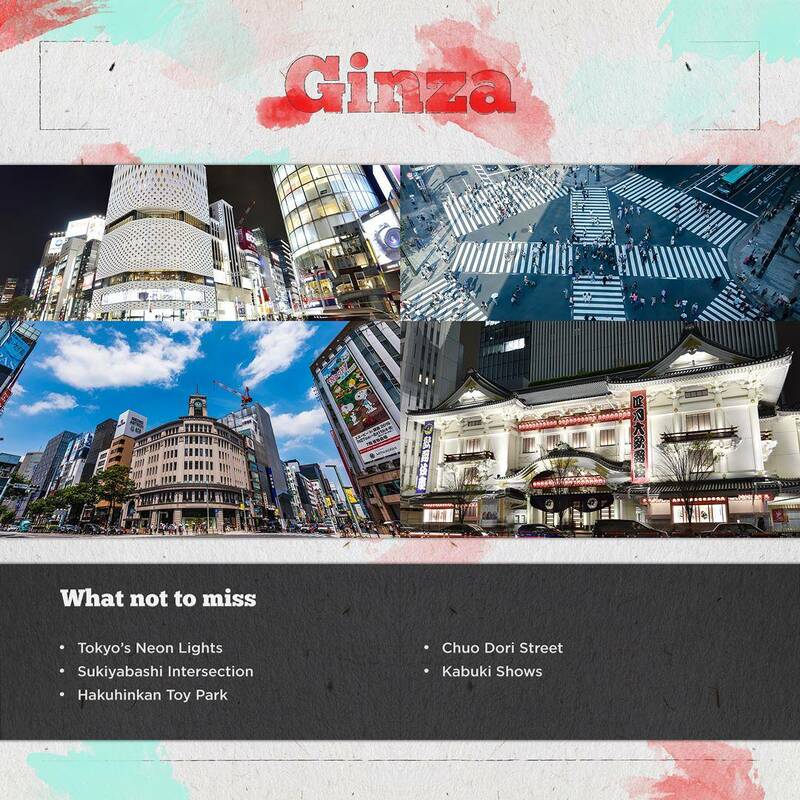 From dazzling plazas wafted across by couture-clad locals, to endless decadent dining options, Ginza is renowned as Tokyo’s purveyor of luxury. As much as the lengthy Chuo Dori Street is an innovative, brightly-lit shuffle of contemporary culture, this neighbourhood also fuses Japan’s future with its past by way of ancient architecture, quaint tearooms and Tokyo’s most famous Kabuki theatre. Tokyo’s neon lights – Iconic the world over, the bright, bright lights of Tokyo are best enjoyed here in Ginza after dark, when Chuo Dori Street and its surrounds take on a whole new, pulsating vibe. Sukiyabashi – A concentrated area of futuristic architecture and dazzling billboards, Sukiyabashi intersection is one of the most photographed areas in the whole of Japan. Hakuhinkan Toy Park – One of Tokyo’s largest toy stores – this is your one-stop-shop for all the Hello Kitty and Pokemon merchandise your suitcase can take. Chuo Dori Street – Home to many of the area’s most tempting designer stores, this breezy street is often pedestrianised for easy window shopping. Kabuki shows – Ginza’s famous Kabuki-za theatre offers up to three performances a day. 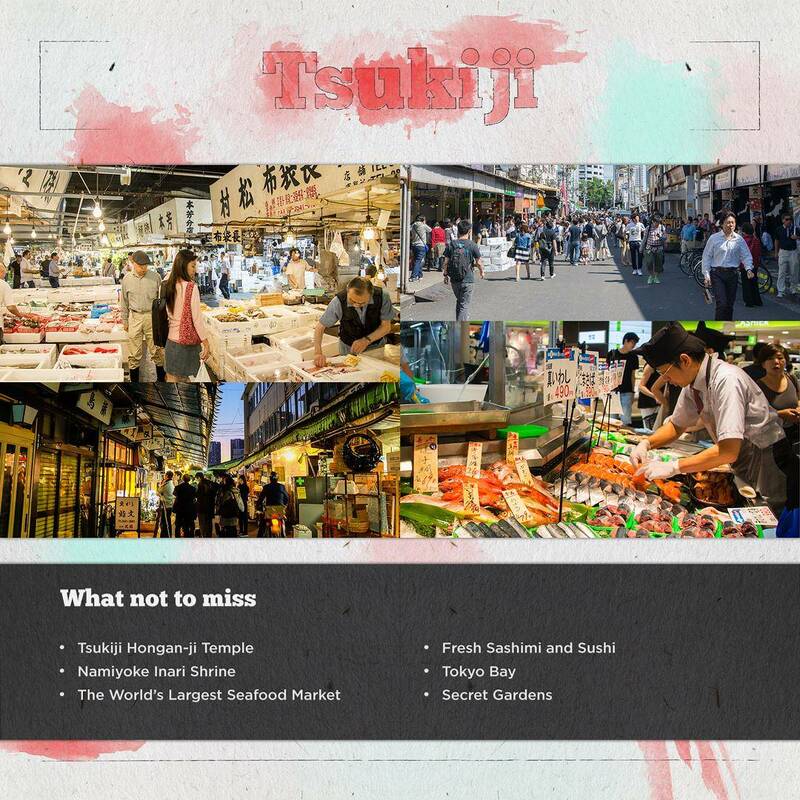 Loud, bustling and brimming over with bargains, if Ginza is Tokyo’s chic boutique, Tsukiji is the city’s hectic, vibrant marketplace. Perched within Tokyo Bay along the Sumida River, this neighbourhood has long made its living through the fruits of the sea – a fact hard to forget as you explore the streets lined with sashimi bars, come face to face with the world’s biggest wholesale seafood market and are woken at dawn by lively tuna auctions. Amidst the chaos however, Tsukiji is home to a handful of breathtaking shrines and secret gardens, which offer a welcome slice of sanctuary. Tsukiji Hongan-ji Temple – Ornate and majestic, this Buddhist temple grandly overlooks Tsukiji’s throngs and crowds. Namiyoke Inari Shrine – Nestled between much larger buildings along the water’s edge, this miniature structure is one of Tokyo’s many sacred shrines. Seafood Market – As unappealing as a sprawling marketplace filled with fish may sound, this really is worth a visit, if for no other reason than it being the world’s largest. Stick to the outer market for a less bawdy experience. Fresh sashimi and sushi – If you’re a fan of anything sushi-related, there is no better place in the world in which to sample it. Tokyo Bay – One of the city’s most impressive tableaus, the views across the bay from Tsukiji are particularly impressive. Secret Gardens – Not so secret but ridiculously picturesque, these gardens are a must-see and Hamarikyu Gardens are particularly blooming. Set aside the boundless energy of the city’s financial and commercial hubs, Sumida is a calming call from the past, characterised by rustic bath-houses, wooden residences and shady gardens framing the river. Sumida is also greatly influenced by ancient sumo traditions, which culminate in baying crowds of supporters at Ryogoku Kokugikan arena. As much as the neighbourhood has one foot firmly rooted in the past, Sumida echoes Japan’s contemporary reputation with its burgeoning art scene, manifested in collaborative, creative spaces, edgy cafes and community art projects. Tokyo Skytree – Somewhat out-of-place rising from the hotchpotch of wooden houses and ornate roofs, this is Tokyo’s tallest (and the world’s third tallest) building. Mini Gardens – Dotted throughout Sumida like a sprinkling of emeralds, these soothing green spaces are Tokyo at its most calm. Ryogoku Kokugikan – Catching a sumo wrestling match at this arena is the best way to sample the ancient tradition for yourself. The Edo-Tokyo Museum – A beautifully curated collection of artefacts and literature from Tokyo’s ‘Edo’ period. ← What’s Hot March 2017?